Sorted out offers a variety of services and special packages for our clients. Use the links below to explore our organizing services offerings. Sorted Out offers two distinct tiers of packaging for your organizing needs. Please click on a link below to learn more about the services offered for each. *PLEASE NOTE: All package plans must be paid in full, in advance, no later than the day of the first session in order to receive the package plan discount. No refunds will be given on packages for unused hours. Hours will be put towards future maintenance or projects. Client is responsible for any product purchased. Sorted Out is a “hands on” service. Our professional organizers are physically working in your space to get it organized and managing the project from start to finish. Our process starts with an overall assessment of the organizing project. Through our assessment, we make recommendations on where to begin and what steps to take, and we tailor a plan that fits your needs. The next step is the first organizing session, which is a four hour minimum appointment. In our years of organizing, it takes at least four hours to make truly visible results and lasting changes in an area. We teach and train you and your employees how to take control of paperwork, manage a hectic schedule, get more done in less time, how to enhance productivity. We ask the question what are you doing, why are you doing it, and how can it be better. 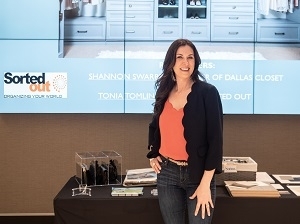 Over the past 14 years working as a professional organizer and running my business it has become vivid to me that a majority of our clients have ADD. Our clients with ADD have a special need for our expertise. They count on us for expert advice and innovative solutions that fit their needs. Our team also consults with medical professionals to learn the best ways to counteract ADD/ADHD when it comes to organization. Moving is considered to be one of the most stressful events in our lives. Most people dread move in day- so much unpacking, organizing and decorating, so little time with busy schedules. We’ll help you manage a lifestyle change when you are upsizing, downsizing, or rightsizing. Our team of caring and experienced organizers can assist you throughout the overwhelming task of moving into a new home. Imagine walking into your newly organized home and everything has a home? We can do that for you!